ADT provides monitored theft, burglary, and fire protection. In all, the company holds a 35% market share and features seven monitoring centers, five in the United States and two in Canada. You will also find there are access controls for larger facilities. The company has certainly grown over time largely due to the acquisition of other companies. It is by far the largest security company in the United States and currently serves over six million people in the country. In 1989 ADT Fire and Security was granted a 45-year contract to maintain the security of the British and American Governments. This is why employee vetting is so in depth and conducted by external sources. While there are several services and assistance ADT provides, their main duty is installing and monitoring alarm systems. They do so by watching and observing from the Customer Monitoring Centers for any electronic signals they may receive from an alarm system. This will occur in the event of an intrusion, fire, carbon monoxide presence or simply by someone manually touching a button. While watching from one of the monitoring centers, a specialist will examine the data that comes in from the alarm system to determine exactly what type of response the alarm signal feeds off. The reaction to this data will depend on the type of alarm. The specialist will either attempt to contact the location or even notify local police, fire or EMS. The goal of ADT is to take care of its customers in every way possible. There are a number of different security companies that you can find all over the internet and in the Yellow Pages. However, none come close to comparing to the services and products that ADT can offer you. In order to get a better understanding of where they came from and how the company has become what it is today, it is important you know the history. The American District Telegraph (ADT) Company originated in 1874 without realizing what it would evolve to down the road. 140 years later, it now protects and serves more than 6 million commercial, government, and residential customers. It is mind boggling to think that it is the company by choice of 90 percent of Fortune 500 companies, 72 of the nation’s airports, and 80 percent of the country’s top retailers. Since first forming as a small security company, it has built up a highly reputable image over time. Dating back to 1874, the company formed using the telegraph that was formed by Samuel F.B. Morse and Alfred Vail. As you are well aware of, messaging plays a vital role in how ADT is run. Because of this, it was the 1880’s that had a significant impact on this company with the invention of call boxes, which were electronic signal devices. This allowed ADT to turn its messaging service into interactive communication from night watchmen and police and fire officials. Moving to the 1890s, the Call Box made some improvements with multi-signal electric protection systems coming about. This allowed watchmen to finally be able to notify ADT offices of buildings’ security at scheduled times. At this time the electric signal service was available in 50 towns and messenger services were available at over 500 locations. In 1901 the company became incorporated as a subsidiary of Western Union. All of the 57 district companies within ADT propelled and grew independently with different systems, equipment, and operating practices. What this meant for the company was the further development of the signal business, which is what ADT is all about today. The company underwent some organizational structure changes in 1909 when Western Union was acquired by AT&T, which led to the company focusing solely on the signal business. The next 20 years consisted of several technical advancements leading to the growth of ADT and any companies that invested heavily in its burglar, holdup and fire alarm systems. This is ultimately the period of time where it became a true leader in the field. During the war years, ADT created the first automated alarm system because of its integrated systems and services. They developed the Teletherm automatic fire detection system along with the Telewave automatic intrusion system. In 1969 the company made the leap to becoming a publicly-owned company with stocks on the New York Stock Exchange. The 1970’s continued to be strong for ADT with technology consistently developing and the company leading the way in its field. It eventually released its first solid-state device with the installation of the first large, two-way multiplex proprietary system. Following up with this was their automated central station, which set up what would become the Customer Monitoring Center network of today. After 100 years of success, the company celebrated its 100th birthday in 1974 by remembering the Call Boxes and welcoming the micro-computer-based security systems that currently took place. The 1980’s saw the debut of the Unimode fire system, the CentraScan computer-based security system, and the Safewatch residential system. On top of that, they introduced the heart of its business with the central station monitoring. These were all drastic improvements and advances within the industry. By 1987 things continued to flourish for the company. It was eventually purchased by the Hawley Group and renamed ADT Security Systems, Inc. Their headquarters were moved from New York, N.Y. to Parsippany, N.J. The early 90’s saw innovative product lines with the wireless Safewatch system, the integrated Focus system, and several different access control and closed circuit television products. Continuing down the road of success, ADT welcomed its 1 millionth customer in the mid 90’s. In 1996 it changed its name to ADT Security Services, Inc. and was relocated to Boca Raton, Fla. In 1998 it was acquired by Tyco International Ltd. And their residential and commercial coverage reached into 230 major U.S. markets. 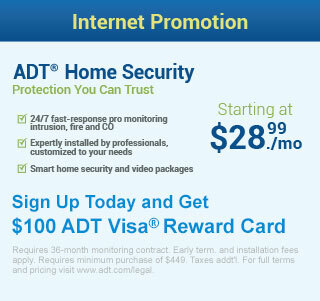 As of today, ADT remains the industry’s leading home security provider. It is committed to protecting and serving all customers with the most advanced security services available. And with unrivaled and unparalleled customer service, things continue to look bright for the company in the future.